A beautiful staircase enhances the home pattern and design, ornamental handrails not only add beauty but serves as guide and guard for you and your children’s safety and elders as well. Indoor or outdoor hand railings can rust over time and when paint or metal primer can no longer protect it against corrosion then it’s about time for a replacement. 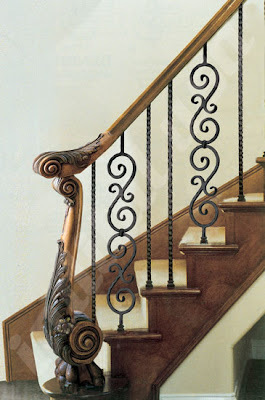 Changing handrails and other railing parts can be a do-it-yourself project as wrought iron railing parts are available in most home furnishing outlets and can be ordered online too. However, for more creativity and decorative work, you may hire the services of handrail and staircase builders. These wrought iron railing parts can also be used for balconies or any other purpose it may serve. Its detailed and intricate designs make it attractive which can improve your home appeal. The stairs primary function is to enable us to move between different levels of elevation. Its form and design suggests expression. There are various unique staircases we can find and see in the internet and magazines to get ideas. To choose between a contemporary or old-fashioned motif depends on your choice as long as it will complement on the house theme. If you happen to be building a house or doing a home renovation project, it is of primary importance to do initial researching to find the right stuffs and materials needed for construction. This will save you time and at the same time will cost you less and save more to spend for other improvements needed later on.